The QL model is particularly suited for indoor-outdoor long load handling. Thanks to large wheels and the 3-wheel chassis design uneven floors, yard work and weather are little more than an annoyance. This robust series features Electronic Hydrostatic Transmission controlled via microprocessor. This enables customized settings for inching - starting - and acceleration curves. The simple to use yet very flexible program allows the operator to set the controls for all types of operational conditions, to obtain the most suitable speed performances and safe load transportation. The powerful LPG or Diesel engines and high capacity hydrostatic motors give the all wheel drive best gradeability performance in its class (20% with 4 ton load). more about the products and options. a PMH dealer nearest you. 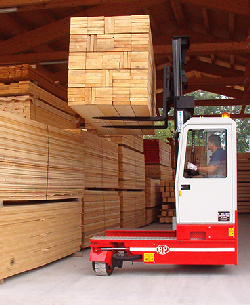 Professional Materials Handling distributes equipment referred to as electric forklifts, IC forklifts, sideloaders, very narrow aisle fork lift trucks, stacker cranes and more. © 2014 - Professional Materials Handling Co., Inc.